Can't you just see your daughters in this fun little dress. Ribbons and bows are always so girly. The pattern is designed to be easy to fit and quick to assemble, yet stylish. With just one pattern piece you can make a dress or a shirt . You can vary the length to create a dress of any length, shirt, or tunic. The shirt looks great paired with the Cute and Quick Pants, also designed by SquigglyTwigs. You have control of the bottom width to make it as straight or as full as you please. 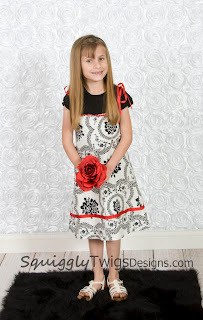 Lastly, by using a contrasting ruffle, and your choice of ribbon, you can add your own personal style. My daughter wears hers with a shirt, long or short sleeve, underneath, making it multi-seasonal.